On August 30, 1813, the Indian tribe called the Creeks, led by Chief Red Eagle, captured Fort Mims. They massacred over 500 American men, women and children. The Creeks Indians were located in parts of Georgia and Alabama. Tecumseh, the leader of the Shawnee tribe, had traveled across the country trying to stir up an Indian uprising against the Americans. Additionally, the Spanish in Florida offered the Red Sticks, a militant group of the Creeks, arms and ammunition with which to fight against the Americans. When American settlers learned of this union, they organized a militia to intercept McQueen, the leader of the Red Sticks. The attack started on July 27, 1813. This battle set the frontier afire, and exposed settlers gathered together in makeshift stockades. One of those stockades was Ft Mims about 60 miles north of Mobile, Alabama. By late August the enclosure had 17 buildings surrounded by a wooden wall. There were between 300 and 550 people in the fort including a militia under the command of Major Beasley. Beasley did not take the threat of a Creek attack seriously and did not spend enough time preparing and training the defense. 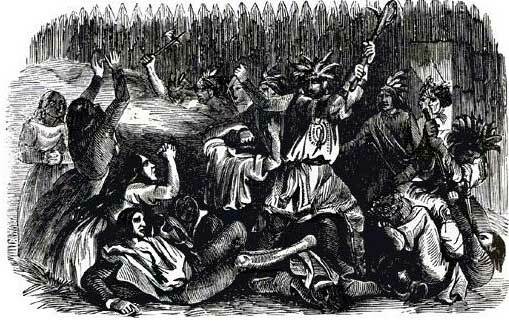 On August 29, Red Stick warriors led by Chief Red Eagle is also known as William Weatherford attacked the fort. The attack continued for four hours, and hundreds of Creeks were killed. However, when the battle ended nearly all of the Americans had been massacred. The massacre sealed the fate of the Red Sticks; the US had no choice but to respond with overwhelming force.